Put all ingredients in a large bowl and stir well. Transfer to an 8 by 8-inch baking dish that has been lightly coated with olive oil. 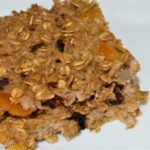 Pour oatmeal mixture into dish and bake 45-50 minutes or until slightly browned and crispy on top. Prepare this dish up to two days in advance. Store in the refrigerator. Bake uncovered in the oven when you are ready to eat. Spread almond butter or Date Honey on each serving. Top with Cinnamon Baked Apples. Double this recipe and bake in a 9 by 13-inch casserole dish.